Merkur make many different razor models, only a couple of which are slant bars. 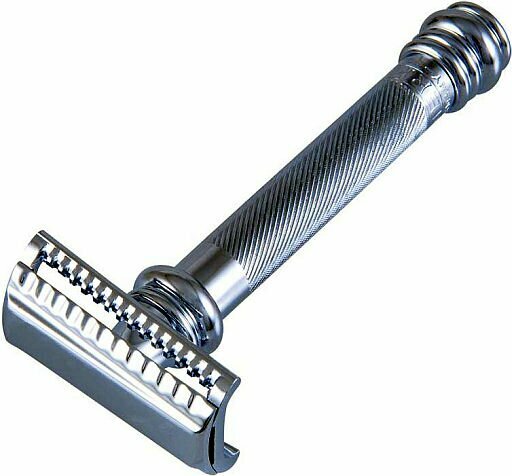 Before we start it should be pointed out that these slant bars are aggressive razors and are not for DE shaving beginners. If you look at most DE safety razors you will see that the blade is protected by a bar and that this bar is straight so the exposure of the blade is constant across the width of the blade. They make two models with this feature, the 37 and the long handled 39. The 37 is the original version and there are some good reviews of it here. The 39 is more recent, a result of customer demand, and is known as the Slant Sledgehammer. In the right hands they will give you the quickest, closest DE shave on earth. In the wrong hands they will cut your face to shreds. So who are these slant bar razors for? Experienced and confident DE shavers obviously. But they are ideal for people with a very strong beard growth and a thick stubble. The scything action will go straight through this. Another group they are very good for are those with sensitive skin, the cutting action is so efficient that used properly it removes the hair with the minimum trauma to the face. Initially I ordered the 37c short version Slant Bar razor and it was fantasic. One pass is all you’ll need with it. But being use to a longer handle, I then bought the 39c model. Although it’s very solid, I found the handle too heavy and for maneuverability with such an aggressive razor, you might want total control. I’ll go with the 37 version !